In the United States, wood storks (Mycteria americana) are distributed from northern Florida to southern North Carolina and west into Mississippi. The U.S. Fish and Wildlife Service lists the species as endangered throughout its range and the Georgia Department of Natural Resources lists it as an Endangered species in the state. The population size of the species declined dramatically in the last century, from 20,000 to 5,000 pairs, due to the loss of wetlands for foraging (the result of development and drought) and high levels of nest predation. The current population estimate is approximately 8,000 nesting pairs. Wood storks nest in colonies. The species requires specific conditions for nesting that influence the success of producing young. First, the nesting colony must lie in close proximity to a wide variety of foraging sites. 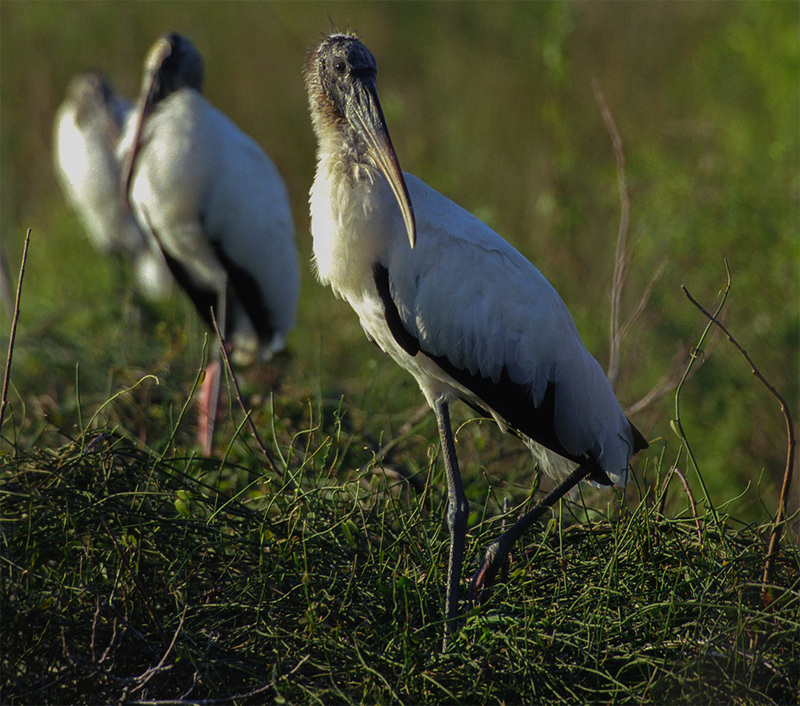 The wood stork feeds only in shallow water, and needs dense concentrations of food to enable efficient use of its tactile and non-visual foraging strategy. Second, the nests require protection from mammalian predators—primarily raccoons. Wood storks prefer to nest in trees that stand in water or on islands; this strategy ensures that mammalian predators must swim to the colonies, and in doing so, become vulnerable to alligators that often congregate under wading bird colonies. A recent study shows that colonies reduce extinction rates when they live: on islands with less connection to the mainland, in larger numbers of nesting pairs (and therefore potentially larger colonies), for longer in areas with higher precipitation during the 12 months preceding nesting, and among shrubs, as opposed to purely trees. St. Catherines Island hosts two currently active nesting sites, both on islands in restored ponds. The nesting habitat for the wood stork also provides nesting and roosting habitats for other colonial nesting bird species, including: black-crowned night-heron, yellow-crowned night-heron, great egret, snowy egret, little blue heron, tricolored heron, green heron, and pied-billed grebe. Finding Wood Stork Habitat and Conserving the Right Features, Final Report for the Georgia Department of Natural Resources, Brunswick, Georgia, by Jo-Szu (Ross) Tsai and Peter Frederick, 15 October 2011.